Pageant's motto is "Education is the future". We could also say that the environment is the future. 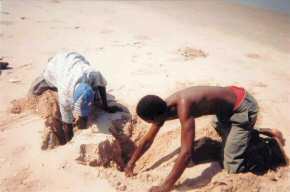 Children in The Gambia are passionately concerned about their environment and wildlife. 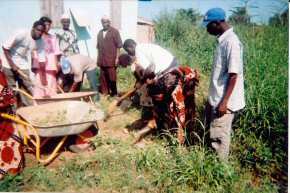 The Gunjur Environmental Protection and Development Group (GEPADG) is based in Gunjur, on the Atlantic coast south of Banjul. It was founded by Mr Badara Njie Bajo, and is staffed entirely by Gambians, motivated by their desire to protect and enhance their natural environment. They work to achieve long-term, sustainable solutions to poverty in The Gambia through reversing the current destruction of forests, mangroves and coastal ecosystems. GEPADG is accredited by both GEF and the World Summit on Sustainable Development (under the UN). GEPADG's voice in the UK is Keith Lawrence, a frequent visitor to The Gambia. an annual village cleaning day. GEPADG is restoring an important coastal lagoon in collaboration with the Global Environment Facility, the World Bank, and the World Wide Fund for Nature (WWF). The lagoon has abundant birdlife, with over 75 species recorded, including sightings of White crowned Robin-Chat, Yellow-Crowned Gonolet and Northern Shoveler. GEPADG works to stamp out illegal activities such as turtle and dolphin hunting, bush fires and tree felling in the forests, mangroves and coastal areas. GEPADG has had great success in regenerating areas of mangrove forest that had been lost due to drought. 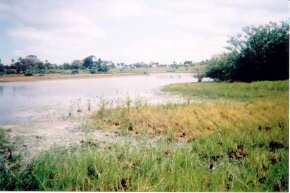 Mangroves are a refuge for many species of birds and animals and are also a vital resource for the people of Gunjur. They protect the coastline from storms, act as a nursery for young fish and provide products such as charcoal, timber & honey. GEPADG volunteers carry out tasks such as maintenance and tree planting in the Gunjur mangrove reclamation area, as well as monthly beach sweeping and village cleaning days. Litter is a major problem in Gambian villages and fish landing sites, causing pollution and spreading disease. 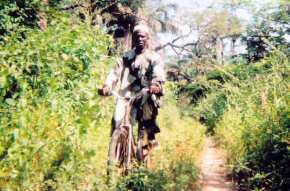 The numerous community forests around Gunjur spread over a large area, so GEPADG's wardens use bicycles to respond quickly and effectively to incidents and illegal activities. Keep up to date with GEPADG's activities on their new website.